Hi, Thought id add a thread to show the progress so far and plans for the future. This is a 1.7 sdi and i have had it for ages as a daily. The colour was where we started and once my wife decided she preferred the golf gtd i started to use it. I have a T5 camper and didn't want to daily it anymore so out came the tools. I fitted coilovers, the gti front hubs/calipers and renewed and refurbed the brakes. Its had a few cosmetic bits on the outside and a GTi bonnet which i stripped to bare ali one day this summer and kinda like it now. aside from this the rest has been maintenance clutch bearings etc but reckon for a little cars with 60 hp its pretty good fun. The future of the car is less certain as i am about to start cranking up the stakes. With a mate we reckon we can double the power. Turbo, injectors, loom and few other bits and lets see. If you 100% standardise the car you will have a bigger audience and might sell it. This way you're very limited and the idiots who would buy it don't have the money. I have split some Mk3 Hella split headlights before, I would say getting the sealant to stay with one half is pretty much impossible, this is OK if you are replacing the same lens as the sealant will be evenly spaced out, but if you are replacing with another lens it could be problematic. An alternative to the original sealant is Tiger seal panel adhesive. In passing - I read somewhere that the white clouding film that appears on the inside of headlights is grease off fingers changing bulbs - this gets burnt off from the bulb heat and creates the film. To the OP - if you open and clean one headlight, I suspect the other will look odd and need the same process done, this is a lot of work with a possibility expensive fixes if you get it wrong. If it was me I would be looking into a non-invasive fix for the crack before opening the headlight up. How bad is the crack? or as your in Ireland the craic? The now defunct wiki was mostly taken from this page I think: Basically, 085 gearbox are weak make sure it is quiet and smooth. Pedal box. Window switches / regulators. Does the engine burn oil or misfire? Nothing is insurmountable if the price is right. Never seen an aftermarket wiper blade as slim as OEM ones - they just look wrong Wasn't aware re-fills were available, good to know when my current ones let go. oh and - Holy thread bump batman! 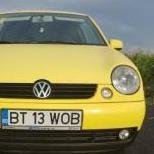 What would be cool is an homage to the lupo on your new car... like a UPO reg plate. Yeah the bellhousing pattern is the same as quite a few dubs, except they've tilted it. The 1.9 gearboxes will bolt straight on, but i have a feeling that the length of the lupo 085 box is about 30mm shorter. Meaning it might foul the crash side member. leave the 085 as is, just tune for power not torque. And rebuild the box every 30k or so. And use really good hypoid bevel oil. I think the limit is 30mg of diesel per stroke for max torque. Once the torque starts dropping, add more fuel. Hey, just thought.... you might be able to achieve the holy grail of a dead flat torque curve. So you get to say 2k rpm and hold the pedal to the floor and the accelaration rate will be constant. Cool. Car will be sh!t off a shovel. Plastic cap looks like gearbox timing reference bung. Can't figure out the leak... is that under the oil cap/filler? GTI Headlight washers - how do I remove them? Bingo! I lubricated the lifter and its fully retracting every time now. Thanks for the advice. You really didn't want to do that clutch did you? What did you get for it? Bye bye and thanks for all the good tips and advice 👍🏻👏🏻 Where did the SDI go? Redex that takes me back 20 years or so,just watched firth gear on YouTube with it,think I will use a bottle good stuf. Lots of start stop driving and frequent cold starts can cause the cat to clog up. A 30 minute steady run on the motorway will clean it out. Th-Schmidt Lines. Chrome Th-Schmidts Splits with gold centres 14" 4 x 100 9" Width Offset - 13 Positive Tyre size 195/45 R14 £950 Reduced for quick sale...NOW ONLY £795 07802833397. About to play with quantity adjuster... any advice? So here's the history to explain all my madness... over the last year. Engine sounded ok but occasionally when hot there was a distinct ticking or pinking sound, as if it was injecting too early. So after messing with pump timing (no effect), running a purge and changing all filters, came to the conclusion there must be a blockage in the tank. Engine was now down on power by a lot and ticking noise all the time (I have two SDIs so can compare easily!). So checked the strainer in the tank. No air leak in fuel lines either. All fine. Hmm. Must be the injectors. So whipped them out and after giving them a good clean, took them to a local place that has an injector tester. All five ports on each injector just fine. All good there too. Chatted with the diesel specialist who thinks its dead cert that the pump has had it. After 92k miles?!? So after much research things started to point to the quantity adjuster servo system being out of whack which can happen apparently (according to interweb). Ok, so out with VCDS last week and sure enough the injected quantity reading per stroke was way too high at idle- like 10mg. Did the bump (hammer) mod thing (as it's called!?! )- or servo position adjustment as I call it, and nudged it down to 4mg. Drove cr and definitely an improvement, but still very much down on power. So as an experiment, nudged it right over to make it idle at 2000RPM when hot, and my god my SDi turned into a rocket ship. Way more power than stock. Ok, so IMHO the pump must be ok. So, I conclude that there is a problem with the QA servo or something related to that. I'm guessing that the servo pickup is telling the ECU that the amount of fuel delivered is too high, so when I demand full power, it thinks I'm getting a full load of fuel, but in fact the pump is delivering probably less than half. So this evening I whipped off the top of the servo head to see what s going on in there. All looks ok. Clean and no jams or anything. I watched how the ECU calibrates itself on powerup, to get the max, then min voltage limits, so it knows where the arm is sitting, in relation to the fuel dump ring on the pump shaft. So I thought if I can change those measurements, I should be able to shift the idle point and subsequently the max power point. There is a calibration reluctor ring on the left side of the horseshoe pickup which you can move to change the limits- see pic. Tried changing them to max then min, while doing the QA injection calibration to get idle back to 2.8mg, but still no change. I'm just about out of ideas! So presently the idle setup is like below. I did notice that the injector variation is quite high which I'm a little concerned about- it might indeed mean my pump's knackered. other pic. Ok, so I've tried to figure out if these settings are right (without any reference sources). See screen shot. There's an adaption setting somewhere, which I believe can be changed to alter the sensitivity of the throttle servo- something like change 32768 to 32700? But where is it??? Right now the car is completely gutless, but the QA adjustment is right. I think the upper servo pickup reading is low however. Before I unscrew the top of the pump and adjust the sensor arm position, I'd like to try the adaption routine. Think it may do anything? Whats Wrong With A Sponge? It all comes down to the flat flace of the sponge. Imagine automotive paintwork with your typical dirt and grit paricles sutck on the top of the paint, that you want to wash off to reveal your car's shine. Some of these dirt particles are sharp. Now, if you place a sponge down ontop of these grit particles as you would do if you were washing your car with a sponge, the grit particles become trapped between the face of the sponge and the paint - they have no where to go owing to the flat face of the sponge. When you wipe the sponge across the paintwork, you wipe the sharp grit particles straight across the paint. As they move over the paint, the dirt particles leave a thin hairline scratch: These little scratches are highly visible in bright light because they catch the light, and this is what gives you the dreaded swirl marks that rob yuo paint of gloss and colour and ruin the car's look. A pic of bad swirl marks, the result of sponge washing of a car. Wash Mitts Lambswool and Sheepswool wash mitts have been developped to get around the problems of sponges trapping grit particles by the flat face. If you run your fingers through a lambwool mitt, you can see that it is deep pile and not flat faced. Returning to the grit partciles on paintwork, when the wash mitt is placed onto them, the grit particles are absorbed into the mitt - safely away from paintwork so that they cannot scratch the paint. Therefore, sweeping the mitt across the paint doesn't sweep the grit over the paint also and so you don't inflict lots of tiny hairline scratches. Note: While washmitts are considerbaly better than sponges, it is impossible to completely avoid inflicting the odd swirl marks here and there using a wash mitt. What follows in this thread are tips on how to keep these inflicted swirls to an absolute minimum. Which Wash Mitt? There are a great number of washmitts on the marked nowadays, ranging from lambswool and sheepswool to cotton chenille to microfibre. In my experience the best mitts are the lambswool and sheepswool. When choosing a mitt, choose one with a soft deep pile that will be kind to paintwork. Two excellent mitts are: Meguiars Lambswool Wash Mitt Eurow Sheepskin Wash Mitt and there are others too. So Many Shampoos! Which to Choose? At the end of the day, shampoo choice for your car is going to come down to personal prefernce. But there are so many shampoos on the market its hard to know which ones to go for! A couple of things to look for when choosing a car shampoo: 1. Lubricity in the washing solution - you want a shampoo that makes the washing solution feel nice and lubricated so that dirt particles can be encapsulated by this lubricant and any that aren't absorbed into the wash mitt will slide off the paint without scratching in the rinsing water. Soapy suds are pleasing and can make car washing fun, but lubricated wash solution is more important. 2. A shampoo should contain no harsh detergents if you are washing a car that you have spent many hours polishing, sealing and waxing. Harsh detergents strip wax straight off the paintwork leaving your paint surface dried out and unprotected. Fairy Liquid is therefore a big no no for washing cars. You feel what happens to the sking on your hand if in prolonged contact with harsh detergents, it dires the skin out - it will do similar damage to paint. With this in mind, there are still a huge number of car shampoos that fit the bill - ones that I have used and rate are the following, so if you're struggling on which to choose, try one of the following: Meguiars #62 Bodywork Shampoo & Conditioner (my favourite) Meguiars Gold Class Bodywork Shampoo & Conditioner Meguiars Hyper Wash (awsome dilution ratio of 400:1 - lasts ages!) Poorboys Super Slick & Suds Pinnacle Bodywork Shampoo & Conditioner Einszett Perls What is the "Two-Bucket Method" Again, millions of people use a single bucket of car wash solution to wash their car, but if you read the threads on this site you will find most members wash their cars using the "Two-Bucket Method" - whats that? As suggested by the name, the two bucket method uses two buckets, not one. In thie first bucket, you have your car wash solution as normal. In the second bucket you have clean fresh water. First off you soak your mitt in the wash solution and begin washing the car (as described below). Then, before dunking the wash mitt back into the wash solution, you rinse it out in the second bucket of fresh water - this rinses out the dirt and grit particles from this mitt so that they cannot come into contact with your paint, reducing the number of swirls inflicted. A grit-guard is also a very worthwhile investment and sits at the bottom of the bucket (I have two, one in the rinsing bucket and one in the wash solution bucket). When dunking you mitt into the fresh water bucket, rub it across the grit guard to increase the amount of grit particles which are removed from the mitt. Also, it keeps them trapped at the bottom of the bucket so even less chance of the mitt picking them back up and them reaching your paintwork to inflict scratches. Washing Here I describe the generic technique I use to wash cars... Wheels, Arches, Door Jambs Start with these. When washing your wheels using a wheel brush, the shampoo solution (or wheel cleaner solution) can spray up onto paintwork, and if youve just cleaned the paintwork, you'll end up needing to clean it again to remove the dirty spray from wheels! Don't forget to open all doors and boot and clean the doorjambs and the insides of the door (without getting wash solution into the locking mechanisms, I cover these up) - these areas can pick up a lot of dirt as well and it adds something a little extra to open the door and see the jambs as clean as the rest of the car as these areas are often forgotten about. Pre-Rinsing This loosens up dirt and wets the paintwork ready for washing. Using a hose pipe, direct a gentle spray of water at the paintwork at a shallow angle. If you blast the paintwork with high pressure at ninety degrees to the paintwork, you'll force grit into the paint and cause scatches. Just a gentle spray of water to wet the paintwork is all that is required. If you don't have access to a hose, use a watering can with the rose fitted to produce a gentle spary of water: Shampooing This is the major stage of the washing process, and the time when most scratches can be inflicted if care is not taken. This removes fresh surface contimaniation from paintwork such as dust, grit, mud, road film etc... Add the correct amount of car wash solution (according to the dilution ratio on the bottle) to your bucket and fill with water to produces suds and lubricated wash solution: The water can be cold, or warm - I prefer warm water as it keeps my hands warm, especially in winter!! Now, use the two bucket method described above. Use two washmitts - one for the top areas of the car (roof, bonnet, upper sides above the wheel arch line) and one for the lower areas (below the wheel arch line, front and rear bumpers). Use a light parallel motion when washing, with out applying forceful pressure that will inflict scratches. If a mark is stubborn and wont come off with gentle movement of the wash mitt, it will require a stronger cleaner such as tar remover or clay. Start from the roof and work down, therefore the large quantities of dirt that form on the lower parts of car are not transferred to the traditionally cleaner upper areas of the car. Try to avoid letting the shampoo dry on the paintwork as this will cause streaks and soap spots, for this reason try to avoid washing in direct sunlight. If you are in direct sunlight, it may be neccessary to wash and rinse a panel art a time. Continue until the car is completed. Rinsing Once washed, the next step is to rinse away the soap bubbles and film. If using a hose I first of all use a light spary of water to wet the paintwork (using the rose on the watering can), just like the pre-rinsing step. Then follow this up with a flow of water from the hose (rose off the water can this time). Most shampoos are free rinsing and require this flow of water to make the rinsing water "sheet" off of the paintwork. (This sheeting effect will work best on well sealed and waxed paintwork). On a sealed/waxed car, keep rinsing until the water sheets cleanly off the paintwork and leaves behind only water beads and not flat regions of water. This makes the car essentially self drying! Rinse from the top of the car down. Drying Another risk stage as far as scrathes are concerned. First off, I find that using a waffleweave drying towel is far safer and more effective than using a chamois leather. A couple of examples of good quality waffleweave drying towels are: Meguiars Water Magnet Drying Towel Poorboys Waffleweave Also Pakshak towels are very very good too! Rather than sweeping the towel across the paintwork to remove the water, I prefer to pat dry the car. The sweeping of the towel has more risk of inflicting scratches as stray grit particles may be picked up and inadvertantly swept across the paint inflicting swirl marks. Instead, pat dry the car by laying the towel down over the wet paintwork. Gently pat the towel, then lift off the paintwork. The towel will absorb the water to dry the paint. A thin flim of water may be left behind but this will quickly evaporate to leave a sparkling, streak free finish. And there we have it - safe washing technique to avoid inflicting dreaded swirls into paintwork.